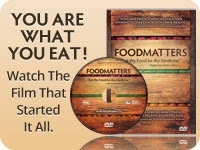 The food industry, and the diet food industry in particular, rely on you being misinformed about nutrition. Luckily for them, we all live this crazy busy life where we want our food choices to be easy, so we create mental shortcuts based on what their advertising implies. 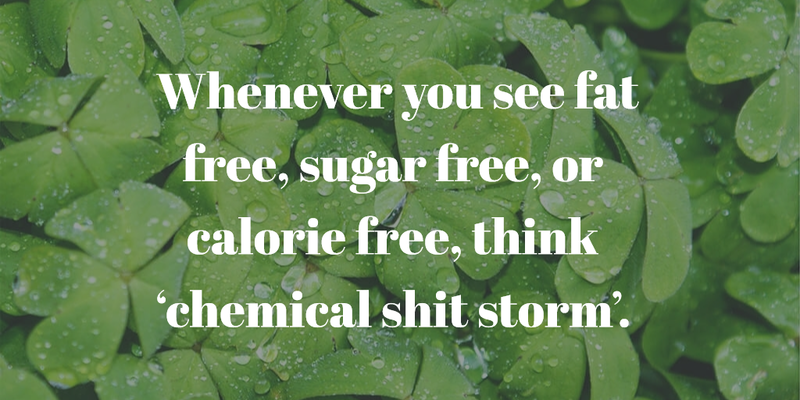 Fat is bad, sugar is bad, calories are definitely bad (the less the better, right?). It works well, for the companies manufacturing the processed food and making the big profits, but it doesn’t work well for the human body. That’s good advice. Whenever a food goes through a process to remove naturally occurring fat, sugar or calories, it’s safe to assume unnatural elements (such as chemicals) are involved. Even ‘no added sugar’ should make you wary. Foods that people expect to be sweet may be sweetened with chemicals if no sugar is added. Food is meant to provide calories for your body. That’s its original and primary purpose. If something has no calories, it’s probably not food. 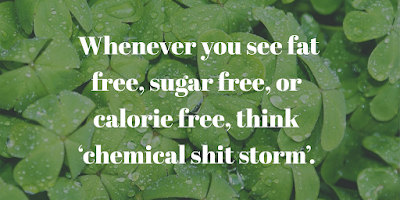 For example, all those diet drinks that really are just a chemical cocktail, including a harmful food substitute in the form of some kind of artificial sweetener. 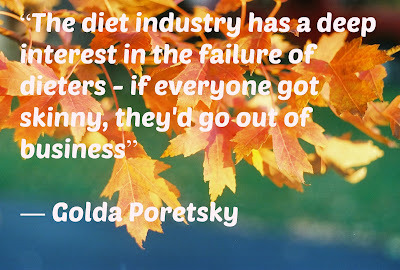 The diet food industry makes a lot of money off the term fat free, which is odd considering what an important part of a healthy diet fat is. They might just as well advertise their wares as protein free or vitamin free, except that ‘fat’ of course has a negative connotation, based on the undesirability of ‘being fat’. Dietary fat is an essential nutrient, which is why you hear some fats referred to as essential fatty acids. Nutritionists suggest that fat should form around 30% of a healthy diet, so anything fat free upsets the balance. It’s true that not all fats are created equal, and high fat diets can be detrimental to health, but including healthy fats as part of a balanced diet helps protect your heart, support joint health, and contribute to healthy skin among other benefits. Research even indicates that a diet high in healthy fats ensures brain health and is perhaps THE key factor in preventing Alzheimer's disease. See this long, but very informative, video about protecting yourself from Alzheimer's with a diet high in healthy brain supporting fats. #3 There’s only one ‘weight loss formula’ and there’s nothing secret about it. I’m getting tired of these ‘secret weight loss formulas’ that pop up (often literally) all over the web. When everyone we knew was trying every diet from Atkins to South Beach, a friend and I joked we were going to release “The Blatantly Obvious Guide to Weight Loss”. It would consist of just four words: Eat less, exercise more. · Expend more calories than you consume. · Consume less calories than you expend. · Put fewer calories in your body. · Use more calories up. · Both of the above. · Consume the same amount of calories that you use. I know it’s not easy, but it IS simple. Eat a sensible amount of healthy food. Find forms of exercise you love and do them often. And remember, the diet food industry's best interests and yours are not the same thing. If you need help with finding yummy healthy recipes, beating unhealthy food cravings and other tips for healthy, happy weight loss, download our FREE report Healthy Weight Loss Success. Remember you can follow us on Facebook for regular health and wellness tips.